The picture of Marie Skłodowska Curie's statue in the old town of Warsaw is probably the picture I'm the most proud of in my whole career. First off, Maria Sklodowka Curie is not only one of the most recognized heroes of Poland but in human history. She is one of my personal heroes. For those who don't know Maria Sklodowka Curie was a good friend of Albert Einstein. She discovered two elements: polonium and radium, and is the only person in history to have been awarded two Nobel prizes in two different disciplines: physics and chemistry. And no, she is not French! She is Polish but was married to Pierre Curie, a French scientist. 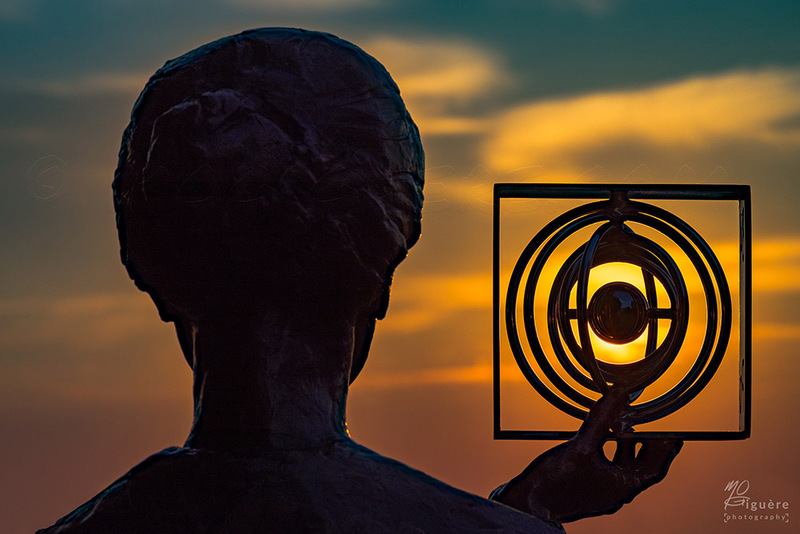 Her statue in Warsaw shows her holding a polonium molecule. When I first saw the statue, I said: "But wait, the radium is missing!". I was obsessed with the idea of adding the radium molecule and this when I thought: "The sun is radiating light so it will be the radium molecule! " Now that I had the idea nailed down, I had to figure out how I was going to do that. I knew that the sun rises East and the statue is facing East so the biggest problem of the puzzle was solved. 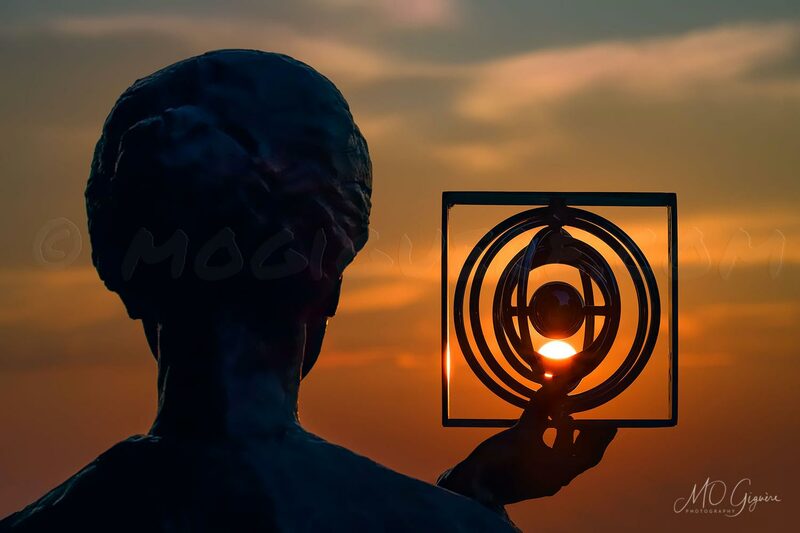 The next problem was to align the sun with the statue. I use this fantastic tool called The photographer's Ephemeris to know exactly when and where the sun and the moon rise and set. Nothing is left to chance. Based on my calculations, I had to wait 4 months for the sun to be at the right position. When the time came, I only had a window of 1-week or so to take that picture. When the day was nearing, I was nervously checking the weather forecast. It always help to have a little luck on your side ;) I was lucky enough to have almost no cloud on that particular day. On a technical standpoint, I had to figure out where to stand and what focal length to use in order to have the sun the same size as the polonium molecule. After a few tries, I got everything right and away I went shooting like crazy. I have never so nervous as a photographer because I knew I couldn't screw up and let that special moment get away. I only had around 15 minutes to take the picture I wanted because as the sun goes up, it becomes brighter and brighter and it loses its well-defined clean sphere shape. My first idea was to put the sun right behind the polonium molecule to create like an explosion. Here is the shot of my initial idea. Although it's really cool, I wanted to show the radium molecule so it meant showing the sun. That's why that shot didn't make the cut. I had other technical challenges in shooting the statue but those challenges are part of the behind-the-scene unrevealed secrets ;) If you go on site, you'll quickly see why this isn't an easy picture to take. There you have it.